After a successful run of dates this past spring, Passion announced they will be headed out again this fall for the latest round of “Passion Worship Nights,” hitting 20+ markets coast to coast including Los Angeles, St. Louis, Indianapolis and more. 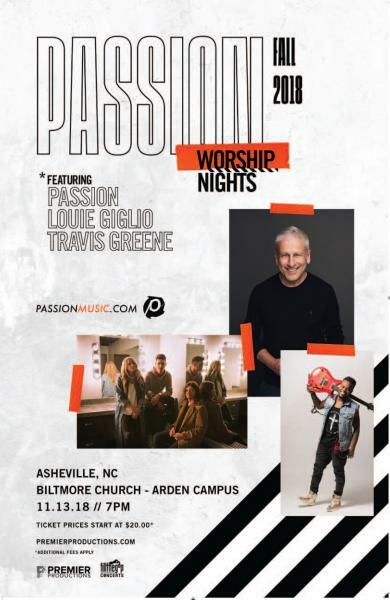 Running Sept. 26 through Nov. 16, the evening will feature worship from Passion and teaching from Louie Giglio, with special guests Levi Lusko, author and pastor of Fresh Life Church, two-time GRAMMY® nominee Travis Greene, alongside hip hop artist and author Trip Lee, on select dates. “Passion Worship Nights” will feature songs from Passion’s latest chart-topping Whole Heart, including the uplifting anthem, “God, You’re So Good,” which was just released as the first single to radio. The song is a powerful reminder that no matter the circumstance, the truth of God’s goodness can always be sung.